April 29, 2012 – Journey to my heart…. I know of the importance of getting enough sleep. It helps with many things, but right now my focus remains health and wellness. And being a girl who likes graphs and charts, I wear a Lark to bed each night. 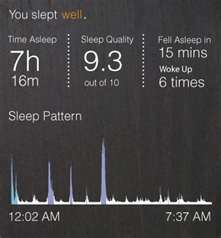 The Lark tracks how much sleep I get and the quality of my sleep. At first, in all of my good planning, I was doing great with getting to bed on time and adjusting my sleep and schedule to ensure my goals were met. But then life gets busy and I enjoy people and I start making plans that infringe on my goal to get 7 to 8 hours of sleep. And soon I see how my averages are dropping and soon I am pushing five to six hours each night. And I begin to calculate that in a week that leaves me almost 14 hours short of sleep. How are you doing with your rest routines. Are you getting enough sleep? Consider joining me this week in scheduling your sleep to ensure you are sleeping for at least 7.5 hours each night. I am embracing this as one way to be kind to myself and those who hang out with me during the day. And on that note, it is time for lights out and deep sleep!